Our team here at Whangaparaoa Vet Centre have a genuine passion for the work we do. We can’t think of a better job than working with pets and seeing the pleasure that they bring to our clients. We understand the bond that develops with our cherished pets and greatly appreciate the trust our clients place with us. We are very fortunate to have four dedicated, highly experienced and compassionate veterinarians that have together got a stunning 74 years of experience. This provides us with a broad range of skills and knowledge shared within the group. In house referral and discussion of cases is invaluable. Our sister clinic, East Coast Bays Veterinary Centre, also provides a further four experienced Veterinarians for collaboration over cases for our clients. There are various advanced procedures, not offered at many veterinary centres, such as gastroscopy, rhinoscopy, cystoscopy, laparoscopy, dental Xrays and TTA's (a tibial tuberosity advancement, which is an advanced knee operation) that can be performed through our sister practice. Having four vets allows us to be open seven days a week and until 7pm during the week. We can also normally offer an appointment when it suits you and most importantly see you immediately if your pet requires urgent care. Our nursing team is crucial to the quality of care that you can expect at our clinic. We have eight fully qualified nurses with seven at the highest diploma level. 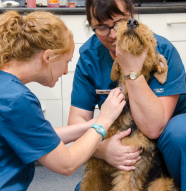 You can be assured at our clinic that your pet is being fully monitored while under anaesthetic and afterwards. When you leave your pet in our care all its needs will be monitored by our nurses along with doses of love and attention. The front desk is also manned by experienced qualified nurses who can give you a world of advice. Our staff are involved in numerous continuing education courses and we have an excellent reference library. Our clinic has a subscription to the Veterinary Information Network, which is the worlds leading online informational resource for veterinarians, and a subscription to an educational service called on the floor with dove. We also have an excellent relationship with the Specialist Group for advice. We have a purpose built practice with a sterile surgical theatre and a seperate isolation facility. We also have a light and spacious boarding cattery and convenient parking. We have a wide range of equipment that is crucial to any claim of providing modern veterinary care. Our equipment includes the very best in blood testing laboratories that provides us with the ability to provide on the spot accurate diagnosis when your pet is unwell for immediate appropriate therapy. Advanced testing in house with hormone, electrolyse and blood gases is also available. We have the ability to culture bacteria, run blood pressure checks, ECGs, radiography and ultrasound examinations. We have advanced digital anaesthetic monitoring equipment, LED surgical lighting, infusion pumps and orthopaedic equipment. Our dentistry facilities include a full dental cart just like your own dentist. We have a large autoclave for sterilising equipment, valleylab electrosurgery and more. We are careful to provide family friendly value across our full range of services. Benchmarking surveys indicate our practice is in the middle to low middle range on most pricing. We are neither too high nor so low that quality care cannot be provided. We are proud to be part of the Whangaparaoa community that most of us live and participate in. We support the welfare of many abandoned and homeless felines in the area through our work with local cat charities. We are one of the few clinics to provide a generous reward scheme for our clients. Membership is currently free and points don't expire. You collect points on all your pets needs automatically when you visit. You can leverage your visits for discounts on services, pet essentials like food, flea treatment, and more. You receive up to 5% in points on most purchases and each point is valued at one cent. The amount of points that can be put towards various purchases and services is available at reception. There is a link on the home page that can give you access to alot of your pets records. You can use your email as a login, which will need to match the email we have on file to create the link. Your password, which can be changed, is initially your client number, which is available by contacting reception. This feature updates nightly so will be available to you the following day after you sign up. You could search when you last bought a flea treatment or medication, or when your pet is due a vaccination. You can even check your pet's weight and make a graph. You will be able to check and correct your details, make an appointment request or check your bonus points. We hope you find this new technology fun to use! Whangaparaoa Veterinary Centre opened its doors originally in 1979 by Richard Dean in the old Whangaparaoa shopping centre. The building that had formerly been a wine shop and then butchery was stiflingly hot in summer and bitterly cold in winter. A southeasterly wind always blew rain under the corrugated iron roof and sent drips through the ceiling in the most unfortunate of places. The single examination room had a bench attached to the concrete brick wall. Medicines were kept on shelves in the treatment room. The clinic had three plywood dog cages and five cat cages of dubious construction. Developing radiographs involved running out the back door (not good in the rain) and into a clay floored basement darkroom. An immersion heater was dropped into the radiography developer, which was sometimes forgotten, resulting in a two hour wait for the developer to cool down from near boiling point! Richard Dean developed a strong following among the horse owning public from the North Shore trotting fraternity of Dairy Flat and Pony Clubs of North Harbour, Albany, Redvale and Coatesville. His untimely death in a tractor accident in 1987 was a shock to many clients and friends. A bronze plaque in his memory is placed outside the front door of our clinic. Jim Grayson and Neil Twentyman bought the practice from Richard Dean and moved it to the current purpose built premises in 1993. With the development of Gulf Harbour and the loss of the last grazing area on the Peninsula, Neil Twentyman moved his horse practice to Dairy Flat in 1995, where he continues to practice today. Jim Grayson decided to retire and chose to leave the practice in good hands, by selling to Steve Gordon in 2007. Steve also owns East Coast Bays Veterinary Clinic on the North Shore and brings a wealth of experience to the Practice. Jim continues to maintain the building and grounds and is an active member of the community. In 2009, Veterinarians Emma Gerber and Shanti Scott both became partners in the practice. Veterinary medicine has evolved dramatically from the early days and Whangaparaoa Veterinary Centre has evolved with it. Radiographs are now developed "inside" in an automatic processor, blood tests are run in our own in-house laboratory, anaesthetics are monitored with high tech gadgets, qualified Veterinary Nurses tend to patients every needs and so much more. Looking ahead we have great plans and dreams for the practice to be the best it can be, offering the best service in the region to both the animals and their owners. We are proud to have become BESTPRACTICE accredited in 2017, and this is a testament to our ongoing commitment in providing the highest level of service and care to our clients and patients. The New Zealand Veterinary Association’s BESTPRACTICE accreditation programme is New Zealand's only quality accreditation programme that ensures the highest standard of service and professionalism for veterinary clinics and hospitals in New Zealand. BESTPRACTICE is currently a voluntary programme so you know when you choose an accredited clinic, your veterinarians stand by their excellence, because they volunteer to undergo an extensive audit every two years.